Another shot from the day London stopped for snow. I am minutes away from jumping on a plane, so my posts will be a little erratic over the next month. I was not organised enough to set up posts to magically appear while I am travelling. I wont be commenting on your sites as frequently during the month but will catch up where ever possible. A few postcards may appear here over this time. what fun it is to kick in french snow !! ... but you have not forgotten the 15th, the subway day? What a great parting shot for us. The human element makes this photo so great. Have a wonderful trip and I will check your blog while you're gone. Great photo. Is your trip an escape from the weather! Lol! That looks like so much fun, yet still no snow here. Enjoy your trip. Have a great trip. Love the shot. Excellent photo and title. It makes the snow look so inviting. Have a good trip. Well, have a safe hopping on and off any planes and take care. I am wanting to visit London all the more! i could only imagine myself immersed in that kind of scenery coz we don't have snow in our country, hehe. Wow! London snow looks like Wisconsin snow! I love snow crunching under my feet. A city shut down for four inches of snow. What a joke. No wonder you people play girlie games like soccer. On the positive side, there are some great pictures on your Blog. What a nice shot! Hope you have good travels. Just discovered your blog. What a fantastic site you have created. Photos are wonderful. I really enjoyed the photos and content. I lived in London from 1992 -1995 and I remember it snowing just as much then. You have captured it beautifully. I look forward to more travel diaries. 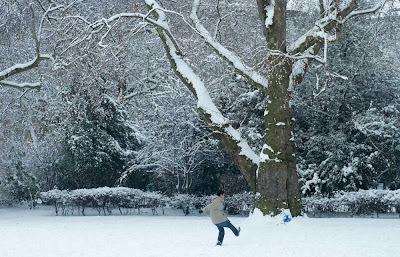 I love the snow.Seeing these shots is amazing learn to love great London. Looks like you were having fun. Have a safe trip.